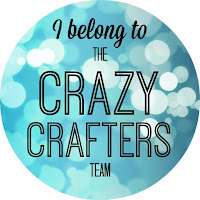 Welcome to the Crazy Crafters Blog Hop for December. This is a very exciting Blog Hop - it's international - since we have the opportunity to mix with a wonderful and talented group called the Pootlers who are based in the UK. This month we are providing sneak peeks at the products in the new Occasions Catalogue. We hope you like our choices and find great inspiration from the projects. We are also combining our hop with a challenge of sorts - we were challenged to use just one: just one ink, one stamp set, one DSP set etc. It was a great learning experience for me - I hadn't realised just how much I normally rely on using a mix of colours. BUT there's sooo much to love in the new Occasions Catalogue that this imposed discipline really was a good thing! To this I added a little black ink and some basic rhinestone jewels. The glittery effect on the petals and leaves comes from the new Wink of Stella Glitter Brush in clear (141897 available 5th January 2016 from the Occasions Catalogue). I LOVE this product because it makes it so easy to apply the glitter to exactly the spot you want it! 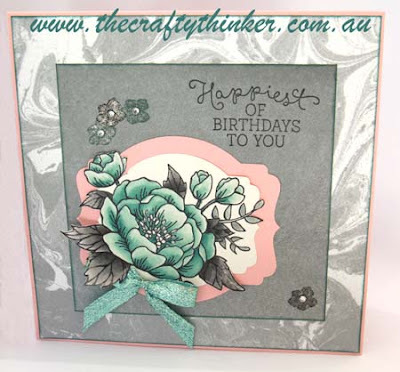 I stamped the flower onto Shimmery White cardstock (121717 available 5th January 2016 from the Occasions Catalogue) and watercoloured it using the Pool Party and black inks - I'm so excited about this cardstock and much prefer it to watercolour paper. The Pool party glitter ribbon is just gorgeous. The DSP is edged with Pool Party ink to match. Thank you for your very kind comment, Vicki. Thank you Sam! You don't know how happy you've just made me! It's been a great experience to blog with your team. Thank you for the challenge too - it was such fun. Ohh love your card Steph! Its so beautiful! Thank you, Kylie! It's such a great stamp for colouring! Love how u have put these elements together! Thanks Em! And I really appreciate you going to the trouble to comment, thank you. Thanks, Jessie. Yes, the Wink of Stella is great - I use it a lot now! Thanks, Angela, for your kind comment & for all the time and work you put into making this Blog Hop happen! Thanks Sarah. The ribbon is great - glittery but easier to make a bow with than the ones in the Holiday Catalogue. Thank you so much - I really appreciate your enthusiasm! It's given me quite a lift! Thanks Lea. Sometimes things just come together, don't they?! Thank you Justyna! It's been a pleasure to "hop" with you! Thanks Anna! 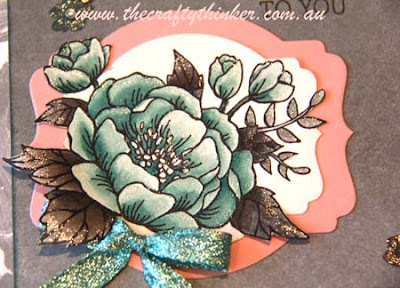 It's a lovely stamp for colouring - not too much thinking required, just very relaxing! Thanks Sue - one of my favourite things to do! 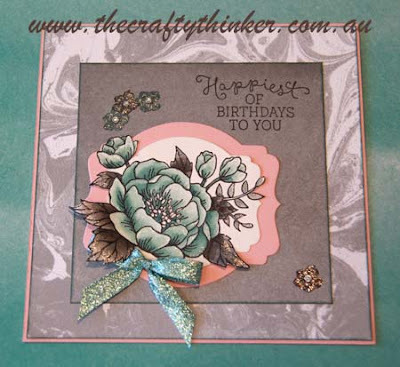 This is stunning Stephanie that stamp set is next on my wishlist! Thanks Katie - yes, it's a beautiful stamp set!